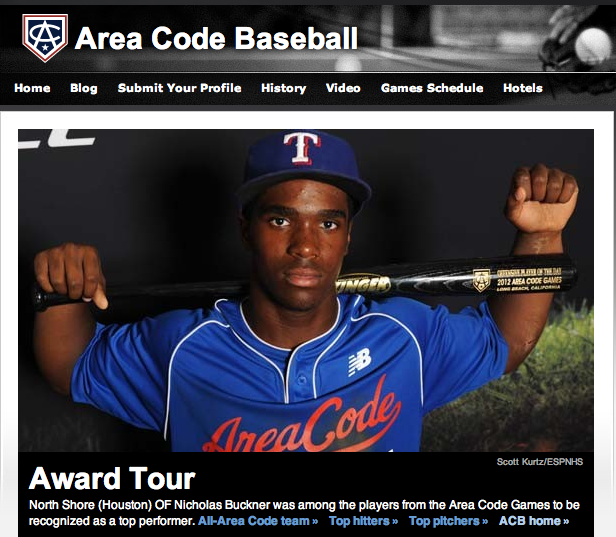 Zinger Bats was proud to team up with ESPN at the Area Code Games in Long Beach California in August 2012. Zinger was the official bat of the games and each of the outstanding players that participated received his very own X Series Zinger Professional bat. The longest balls hit for the entire week were hit with Zinger Bats - including a majestic shot hit by Jon Denney that traveled over 430 feet at Blair Stadium (a graveyard!) using an X74 Zinger Pro Ash. And Corey Simpson started the fireworks on Day 1 by using his brand new X73 Maple to line a double off the top of the wall in right-center the first time he used the bat...and followed that up with a towering Home-Run to center field in his next plate appearance! There were a record 7 home runs hit this year....could it be the bats? We like to think so - and from the feedback we received from everyone, we weren't the only ones that felt that way!